The Society's reprint of Lowther's 1911 county history (minus a few photos) with original index. This hardbound book has 681 pages and includes histories of communities and sketches of early families. Contains names and dates for approximately 325 cemeteries and burying grounds with over 19,000 names. Includes index and supplemental map. 852 pages, hardbound. 309 pages filled with photos of communities, country churches, schools, stores, mills, oil and gas industry, railroads, covered bridges and more. Hardbound book sold out. Available only on CD. Map legend lists approximately 160 school names and nearly all are depicted on map. Map size is 40" x 33". Listed prices are suggested minimum donations. Taken from Pepper's columns in the West Virginia Hillbilly, this book includes tales of the B & O Railroad with articles about the local Ritchie County railroads: Calico/C & K, P & H, and Harrisville Southern. Hardbound, 216 pages. Includes tombstone readings, census records and excerpts of county histories to identify immigration patterns and local Irish settlements. Also includes marriage and death records that provide the birth place of Ritchie Countians born in Ireland. Spiral bound, 116 pages. Softbound reprint of the 1938 Fair Official Racing Program and History. Includes two photos and copies of covers from 1893, 1905 and 1948 programs. 31 pages. Published by the Pennsboro News in 1905, contains sketches of prominent citizens, primarily of Pennsboro, with many photos of buildings and leading citizens. Size is 11" x 17" and contains 26 pages. These maps are circa 1910-1920 and depict farm boundary lines, landowner's name, location of communities, post office locations and some railroads. Some maps contain one sheet (1) and some contain two sheets (2). A 10% discount is available if purchasing seven or more maps. Available Maps: Braxton, Calhoun, Doddridge, Gilmer, Harrison, Jackson, Lewis, Marion, Marshall, Pleasants, Ritchie, Roane, Tyler, Upshur, Wirt, Wetzel and Wood. For an estimate of map size, Ritchie County contains two sheets which are 58" x 34" each. This laminated 44" x 24" map depicts the proposed location of the the Northwestern Turnpike in 1833 from Clarksburg to Parkersburg. Barr added Indian trails, etc. The booklet which accompanies the map is entitled From the Charles River Shire 1634-1642 to the Present Day Counties: Harrison, Doddridge, Ritchie, Wood, Pleasants and Tyler, and contains 69 pages. 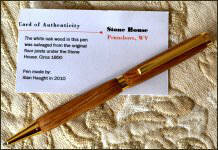 Made by Harrisville Mayor Alan Haught, these wooden pens are made from the original timbers of the Old Stone House Museum. A 7-CD set filled with history, oral tradition, music and more on audio CD. Volumes 5 through 7 contain Ritchie County Route 47 information. These can be purchased separtely or as a set. Searchable database, Windows operating system. The rugged Allegheny Mountains of western Virginia made for interesting tales of early transportation, trade, and migration. Witness the evolution of animal and Indian trails into the region’s premier highway linking the Shenandoah Valley and the Ohio River. Social divisions, violence, and passions left deep scars among the citizens of the newly-born state of West Virginia. Echoes of those Civil War times resurface in the music and stories of the mountain people. Volume 3: We’d All Be Millionaires If We Had It Now! The aftermath of the Civil War brought tremendous change to the Mountain State. The timber and coal boom of the late 1800s and the subsequent downturn in the early 1900s led to extreme hardships for many families. The pace of technology and progress was slow to reach the mountains of West Virginia. The Turnpike was still one of the best roads directly across the central Allegheny Mountains, and one of the first roads to be improved for motor vehicles. Small towns were abundant along the turnpike. From early settlements to early automobiles, decades of change left a mark on the Staunton-Parkersburg Turnpike. A variety of cultures could be found along the turnpike. There were Irish and Italians, Catholic life and pike travelers from gypsies to Jesse James, as well as a history of slavery and the Underground Railroad. Stories of early Parkersburg, West Virginia statehood, timbering, Ritchie Mines, and the oil and gas industry detail the interesting history of the turnpike. Back issues of the Society's newsletters are now available. Newsletters are published on a quarterly basis. Envelope has fresh postage and is ready for mailing. indexes not in the book. Hardback book sold out. Available only CD. Includes nearly 40 depot photos from c1890 to the present, maps and railroad timetables. Softbound, spiral bounding, enclosed in durable clear vinyl covers. 39 pages.